THE GREAT CAT LITTER CAPER! A fun and easy "cake" to make for all occasions. Line litter tray with trash bag, letting it extend over sides. Put cake mixture into tray. 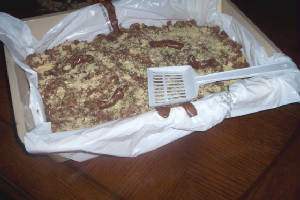 Put crumbs on top of cake in tray and stir A LITTLE to get the green bits into the cake as well as on top. SOFTEN Tootsie Rolls in microwave, then bend into realistic (disgusting) shapes. You KNOW what these represent. Put the candy into the cake, some at the edges and bending over, etc. 3 apples, cored and chopped. I package cornbread stuffing mix. 1 small can chicken broth—or the broth off the chicken cooked for this recipe. Make the stuffing mix according to package directions using broth and the margarine. Add the onion, cubed turkey, soup, drained chiles, cream cheese and corn. Top with shredded cheese and bake in a casserole dish at 350 degrees for 45 minutes to an hour. Let stand about ten minutes before serving. brown beef and onion in skillet. Drain and transfer to Dutch oven. Add drained black and red beans, tomatoes and sugar. Bring to boil and then lower heat and simmer for 1 hour. Add cheese to taste and melt it into the chili. Lisa Weinstein, from Schererville, Indiana, says that her three-year-old son, Nicholas, doesn't miss an opportunity to make these "marshed" potatoes, although she's not sure what he likes more: dumping in the ingredients or stealing from the stash of marshmallows. Heat the oven to 350 degrees. Combine the sweet potatoes, egg, sugar, cinnamon, and vanilla extract in a bowl and mix with an electric mixer on medium speed for 2 to 3 minutes. Empty the mixture into a 2-quart ungreased baking dish. Bake uncovered for 25 minutes. Top with the marshmallows and bake for an additional 5 minutes. Serves 4 to 6. A lighter version of the classic pumpkin pie, perfect to serve as dessert on Thanksgiving. 1. beat pudding and milk in a large bowl until well blended about 2 minutes. 2. blend in pumpkin,cinnamon,and nutmeg. 3. fold in whipped topping,and pecans (optional). 4. spoon into pie crust. 5. chill for 3 hours. 6. sprinkle with gingersnaps if desired before serving. Preheat oven to 375F. Spray coat a baking pan ( 9x9). Put half of the apples in pan. Mix everything else except juice or cider. Crumble half the sugar mixture over the apples. Cover with remaining apples and sugar mixture. Pour juice over top. Bake 35 minutes. 1. Preheat oven to 350 degrees F (175 degrees C). Lightly grease a 2 quart casserole dish. 2. In the casserole dish, alternately layer the sweet potatoes and apples. 3. In a medium saucepan over medium heat, mix together brown sugar, 1/3 cup water, cinnamon, raisins, butter and salt. Cook 5 minutes. 4. In a small bowl, stir together remaining water and flour. Combine with the brown sugar mixture. Pour over the sweet potatoes and apples. Place the lemon slices on top. 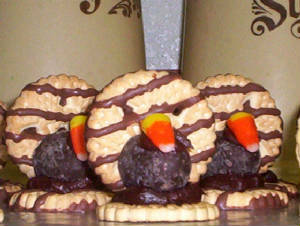 For each turkey you need: two chocolate-striped cookies, one chocolate bon bon, a piece of candy corn and chocolate icing. the bon bon and hold or prop until they stay together. Then attach a candy corn piece for a beak. We’ve seen children placed with us who had no clothing to speak of—a pair of holey socks and some briefs, jeans with more air than fabric, and a dirty tee shirt several sizes too big—but they had a Playstation and two skateboards. When you fix a meal for them, these kids turn up their noses at vegetables and roast. They want burgers and hot dogs, fries and soft drinks. But that’s what they are used to. I asked a case worker why this was and she told me it’s partly because people who use and sell drugs trade a lot in merchandise and not cash. And they don’t cook in their kitchens—at least not food. They eat out most of the time—when they eat. Beyonders are used to cooking. We’re the generation who heard so much about the starving kids in India. (“You should be ashamed of yourselves for not eating that. Don’t you know kids in India are starving?). And we equate food with love. 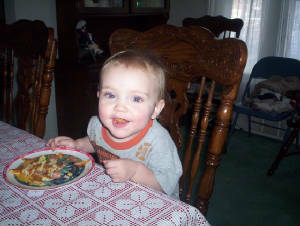 How do you get kids to eat foods they may not like? What can you fix that won’t do you in? Here are a few ideas, and some great websites to visit. "A simple meal to whip up in less than an hour that even the kids are sure to love. Layers of seasoned ground beef, corn, tortilla chips and cheese are baked under a layer of Colby cheese. Monterey Jack is also good in place of the Colby cheese." 2. Place ground beef in a large skillet over medium-high heat. Cook, stirring to crumble, until evenly browned. Drain grease. Remove from the heat, and stir the salsa, corn, mayonnaise and chili powder into the beef. In a 2 quart casserole dish, layer the ground beef mixture, tortilla chips and cheese twice, ending with cheese on top. 3. Bake for 20 minutes uncovered in the preheated oven, until cheese is melted and dish is thoroughly heated. Generous scoops of mint chocolate chip ice cream are sandwiched between homemade chocolate cookies, warm from the oven, for this melt-in-your-mouth dessert that kids adore. 1. Preheat oven to 350 degrees F (175 degrees C). Grease a cookie sheet. 2. Mix cake mix according to package directions, omitting the eggs. Drop by large spoonfuls onto cookie sheet, mixture should be about the consistency of brownie batter. 3. Bake 15 minutes in the preheated oven, or until cookies spring back when touched lightly in center. Cool completely. 4. To assemble, put a scoop of softened ice cream in the center of a cookie. Top with a similarly-sized cookie, wrap in plastic wrap, and gently press down to flatten out ice cream scoop. Freeze until serving. Kaboose.com is a kids site that offers educational games for toddlers to grade schoolers and great tips for parents. Makes 12 burritos, serving 6.